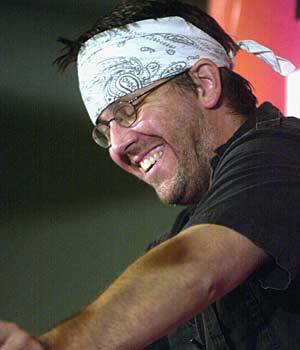 Over two weeks now since the suicide death in Claremont, California of 46-year-old writer David Foster Wallace. This is the kind of sad news that lingers. While it was pretty well known that Wallace was never much personally immersed in Internet culture (his agent, Bonnie Nadell, remarked last week in the New York Observer that, “He has, like, dial-up. By the time you see something you’ve aged 5 years”), his legions of fans certainly were and are, so it’s not surprising that the web has nowhere near exhausted its collective grief over Wallace’s passing. The official unofficial DFW website The Howling Fantods is the place to stay current on the latest links to blogosphere memorials. A real heartbreaker appeared two days ago in the online magazine Salon.com, “The Last Days of David Foster Wallace” by Robert Ito, with quotes from family and friends discussing candidly and compassionately Wallace’s long battle with depression.